Football news: EPL to adopt the use of vanishing spray. 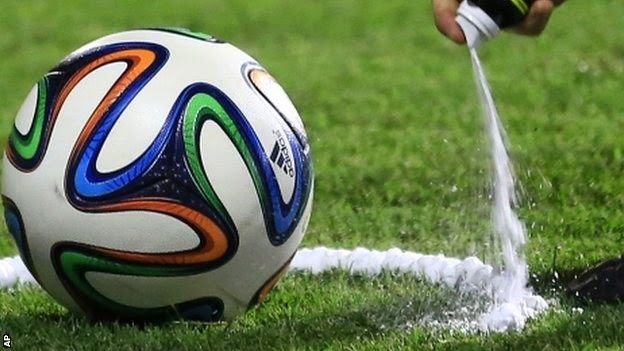 EPL to adopt the use of vanishing spray. EPL to adopt the use of vanishing spray for next season. The English Premier League would adopt the use of vanishing spray, which was used at the 2014 world cup in Brazil, this coming season. The use of the spray by referees is to ensure defensive walls do not exceed their mark during freekick, (more than 10 yards, 9.15 metres). "At the Premier League we are open to developments that enhance the competition and it was clear after watching the 2014 FIFA world cup in Brazil that vanishing spray benefitted referees, players and all those who watched the matches. "Having witnessed that, and following consultation with our clubs and the Professional Game Match Officials Limited, we have decided to introduce it in the Barclays Premier League and look foward to having it in place for the 2014-15 season".